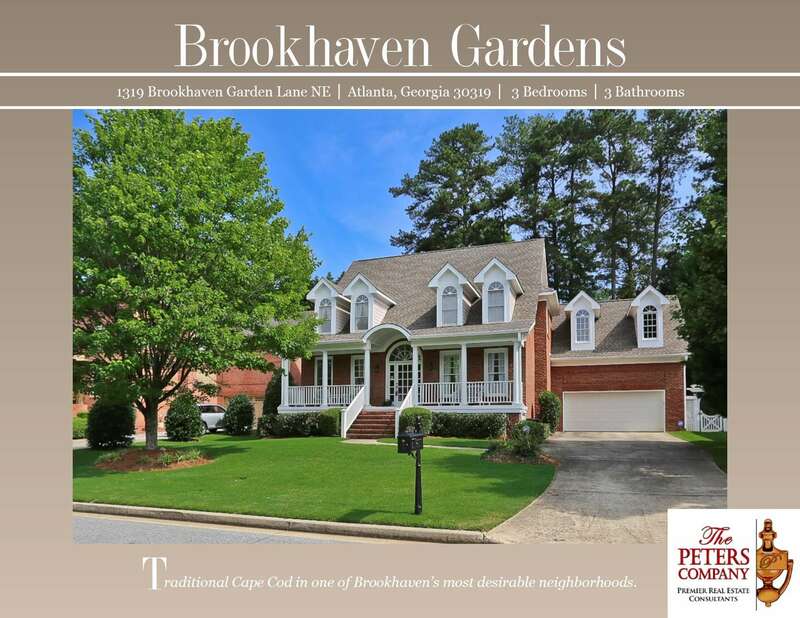 Just Listed :: Beautiful Cape Cod in Brookhaven Gardens! Welcome home! Brookhaven Gardens is a small neighborhood originally constructed in the late 1990’s in the incredibly popular and fast growing City of Brookhaven. Highlights of the neighborhood include an active Homeowners Association, which acts independently and also participates within the larger Brookhaven Fields Civic Association. Each year in the fall, Brookhaven Gardens organizes a block party filled with great pot luck and catered food, a bouncy castle, football on TV, and other surprises. Perhaps one of Brookhaven Gardens’ best features is also the best kept secret of the area, a small fountain filled pond, home to many friendly ducks. The community is built around the pond, and a waterfront gazebo is a welcoming spot for visitors to feed the ducks or enjoy the sounds of the fountain. The residents of Brookhaven Gardens also love the close proximity to favorite hot spots in Village Place Brookhaven and Town Brookhaven. The close proximity to Peachtree Road, I-85, and GA400 makes this home convenient to and from any direction. Greeted by a rocking chair front porch, this home is loaded with custom features, charming character, and a great flowing floor plan. Kitchen features custom cherry cabinets, granite countertops, stainless steel appliances, walk-in pantry, breakfast bar, and spacious breakfast room. Formal living and dining rooms are perfect for entertaining guests. Large family room has a vaulted ceiling and cozy gas fireplace. Hardwoods floors are carried throughout most of the main level. Expansive master suite is a true retreat including a vaulted ceiling, large walk-in closet, and oversized sitting area with additional office or closet space. Spa-like master bathroom features a double vanity, charming claw foot tub, and separate tile shower. Additional bedrooms are well-sized and bright, each with an attached bathroom. Two car garage easily fits vehicles with extra space for storage. A wonderful walkout backyard is complete with large patio, deck with pergola, and professional landscaping including Emerald Zoysia grass. Quiet cul-de-sac street in wonderful location close to interstates, shopping, and restaurants. Call The Peters Company today to see this wonderful home at 1319 Brookhaven Garden Lane NE… 404-419-3619! ← Just Listed :: Beautiful End Unit in Cobblestone at Brookhaven!